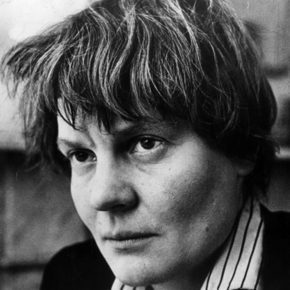 Iris Murdoch (1938) read Greats at Somerville and was up at the same time as three other major philosophers, Philippa Foot (1939) Mary Midgeley (1938) and Elizabeth Anscombe (at St Hugh’s). She obtained a First Class Honours degree at the same time as involving fully herself in student life (including becoming active in the Communist party). Following a period of war work after graduating, Murdoch won a Sarah Smithson Studentship in Philosophy at Newnham College, Cambridge, returning to Oxford as Philosophy Fellow at St Anne’s College in 1948. She was greatly respected as a moral philosopher, publishing several significant works during her career. By the late sixties, however, her career as a novelist took increasing amounts of her time and in 1967, she resigned her fellowship at St Anne’s. Her first novel Under the Net was published in 1954 and was immediately met with much acclaim. She published a further 25 novels over the following 40 years, winning the James Tait Black Memorial Prize in 1973 for The Black Prince, the Whitbread Literary Award for The Sacred and Profane Love-Machine in 1974 and in 1978 the Booker McConnell Prize was awarded to The Sea, The Sea. Her life and work has been the focus of much attention both during her life and after her death. Most notably perhaps, her life was portrayed in the film Iris, directed by Richard Eyre and starring Kate Winslet and Dame Judi Dench. She contracted Alzheimer’s Disease in 1995 and died in Oxford in 1999.